Angela Kulig: HEY YOU, yeah, you! 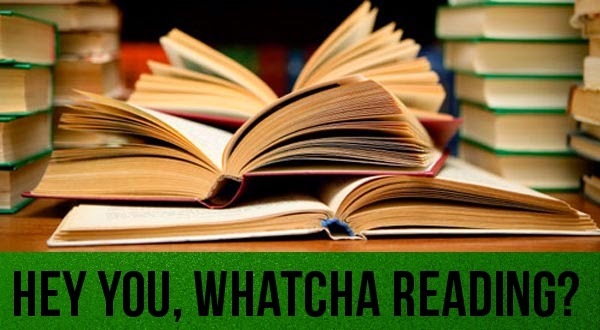 Whatcha reading? So I have to hand a book in to my editor after this long weekend, and I have to hand in another (surprise!) book a week or so into June. NO ONE PANIC! (I mean, besides me!) I know that many authors tend to stop reading when they are staring down the barrel of hellacious deadlines, but I am not one of them. Actually, I read crap tons when I am busy writing and editing. There's a good reason for that, it's because I'm tired. I know what your thinking--wouldn't your time be better served sleeping if your so tired? Well, yeah. IF I was talking about that kind of exhaustion. But I'm not. There is something so draining about living inside your own world for so long--searching for lost commas, coming up with solutions to problems you caused. It's not bad in small doses, but when you start doing it for hours and hours a day you start looking for a way out. That's why I have to read, even when I'm too busy for it. To fix the mental fatigue that I bring down on myself, I like to escape to a universe that I am not the god of. Currently I am re-reading all of Cassandra Clare novels to get ready for the next book, what are you reading? What kind of things do you do to relax?